My younger son Daniel pointed out to me an error in my last post, the topic of which was a recent increase of the frequency of rickets in children in the UK. As would be predictable from previous experience, the incidence was higher in children of South Asian and Black ethnicity than in white children. I mentioned in the Post that the dark skin people living in tropical parts of the world is an evolutionary adaptation to the high intensity of the sun. Daniel pointed out that strictly speaking this is not correct, as Homo sapiens originated in Africa and the vast majority of the world population is dark-skinned, living in tropical or semi-tropical zones. It is the white-skinned population of the world that is a small minority, differing from the majority, and it is this group that is an evolutionary variant, and adapted to living only in the northern temperate area of north-west Europe. What was the origin of this small group? Neanderthal (Neander tal) is a valley close to Dusseldorf in Germany. It is indicated by a sign on the autobahn viaduct that crosses the valley. Skeletal remains of a humanoid species were first discovered in the valley in the 18th century and have since been discovered in other parts of Europe. 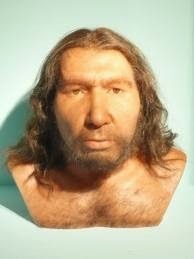 The humanoid became know as Neanderthal Man, scientifically Homo sapiens neanderthalensis. Recent genetic studies have shown that the white-skinned variant of Homo sapiens has in the genome some DNA derived from the now extinct species Neanderthal Man. In other words at some time in the distant past there was a small amount of interbreeding between the new Homo sapiens spreading out of Africa and the older Neanderthals living in Europe, about 60,000 years ago. Little genetic advantage was passed on to Homo sapiens but one is a genetic factor for fair skin, an advantage when living in northern Europe. Another genetic factor is fair straight hair. Darwin introduced the idea of “survival of the fittest”, indicating that if a new gene gives an advantage, then those with that gene will thrive. In north-west Europe a pale skin gave an advantage in the form of enhanced vitamin D synthesis. And so, thanks to the Neanderthal humanoid, white-skinned people are genetically adapted to living very distant from the equator. Dark skin is the global norm of “pure” Homo sapiens. The Neanderthals became extinct as Homo sapiens proved to be superior, but their genetic influence lives on in white-skinned people.